The Healthy Waterways Strategy co-design process is progressing steadily towards the goal of submitting the strategy for Ministerial approval by the end of August 2018. Key activities for the start of the year include developing and testing preliminary environmental and social targets and performance objectives that will enable the targets to be reached. This engagement will take place online via the Healthy Waterways Strategy YourSay website with the draft targets up and open for comment during March. 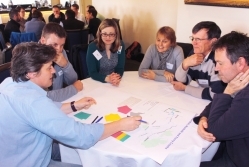 In-person opportunities include the next round of Catchment Collaborations workshops which will take place between 5 – 20 March. For further information and to register for workshops head to the Healthy Waterways Strategy YourSay website, Eventbrite or subscribe to the mailing list. Questions? Please contact the Healthy Waterways Strategy project team.